It’s 3 o’clock in the morning. Conversation got boring. Boo. I know! I’m so corny. I couldn’t help it! Haha! So why the title? 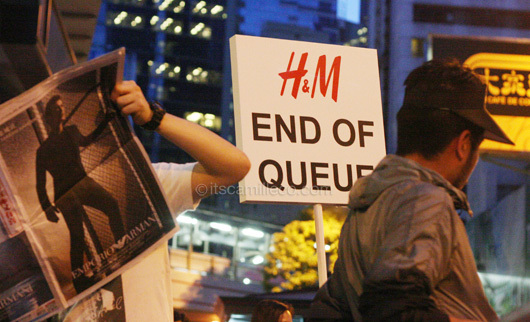 Because last Nov. 17, I woke up at around 2:30am to get ready and line up for the Versace x H&M opening. Yes. I’m still alive and breathing. There was already a line! 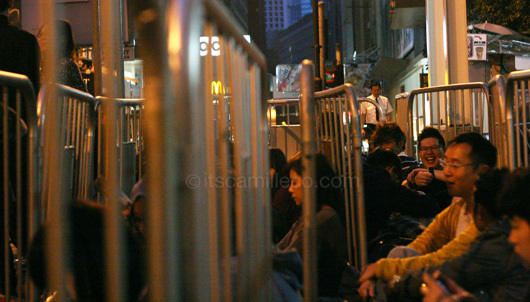 People really camped out! They brought newspapers, blankets, boxes and basically anything they can lie on! After getting our assigned schedule, we found out that my sister, mom and I were probably the 144th-146th people in line. Anyway, so what’s a girl to wear to a craziness like this? Whenever I travel abroad, I make sure to bring light clothes and close to none accessories. I strongly believe in the “pack less, shop more” motto. Actually, my only accessory here is the Versace x H&M wristband. This wristband indicates what batch of Versace x H&M shoppers I belong in. And because I don’t usually get to wear my cute stockings here in Manila, I make sure to wear them at least once during my trips abroad. I also always bring 2 pairs of flats with me. Usually, I bring a pair of boots and a pair of ballet flats. I wear them alternately to keep my feet from getting too sore. I can walk a marathon when it comes to shopping! Flats are must-haves!